I had another one of my “holy cats!” moments this week when I came across this gorgeous artwork from the Spencer Museum. I’ve mentioned that I have these little epiphanies quite often, particularly when I delve deeper into the background of works of art in the Davis Art Images collection to which I have not really paid a lot of attention. Well, being a painter, the cobalt blue of this piece blew me away at the start. 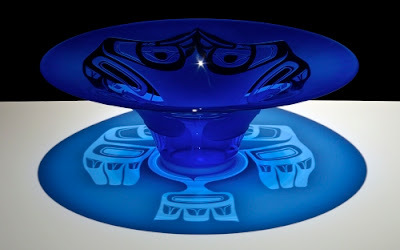 When I researched the artist, it dawned on me that we’re looking at a unique chapter in contemporary Native American artwork: blown glass art. Native American bands first became acquainted with glass in the form of European trade beads. They valued glass for its transparency, its reflective surface, and its brilliant colors. They decorated clothing and objects with the glass beads. Native American-made glass paste pendants were made by crushing European glass trade beads into a paste, shaping and then heating the paste until the glass fused. Pendants are best known from Leavenworth, an Arikara site in South Dakota, but occur at many Native American and fur trade sites in the Plains, Midwest, Southeast, and Northeast regions of the United States. They first appear in the Plains and Midwest in the late 1600s and are not found in the Southeast and Northeast until the 1700s. Preston Singletary’s work fuses the European tradition of glass-blowing with traditional native Tlingit forms and designs. He began glass-blowing right out of high school as an assistant and later learned Venetian techniques of the medium in Murano. He also learned formal aspects of Tlingit art studying alongside other Northwest Coast artists. His native Tlingit ancestry informs his forms which are spiritually based. Other influences are shamanism, transformation themes, animal spirits, and basketry patterns. While Singletary’s work is an extension of Tlingit traditions, he has fused those traditions with modern technology. His work has influenced other Native American artists to work in the glass medium. The Tlingit people inhabit parts of southern Alaska. Traditional Tlingit eagle hats were made of either basketry or carved out of wood. This artwork has inverted the traditional conical shape of the eagle hat, and employs traditional Tlingit symbols as decoration. The eagle is one of the two main primary moieties or clans, the other being the raven. Each of these two primary clans is subdivided into sub-clans and houses. Please visit these websites to see stunning examples of Singletary’s glass art. He has taken traditional forms such bent wood chests, baskets, transformation masks, and even totems and created beautiful, translucent glass works of art. My particular favorite has got to be the bentwood chest in the second link.